I’ve been on a bit of a cheese tortellini kick. I blame it on the Maui Brewery. I tried their fried mac and cheese balls. Okay, I tried them three times. We won’t talk about the weight I gained on our trip. Obviously, I couldn’t go through a gloomy Oregon winter without bringing that cheesy fried goodness to my life. I didn’t really want to figure out how to make messy mac and cheese into balls. 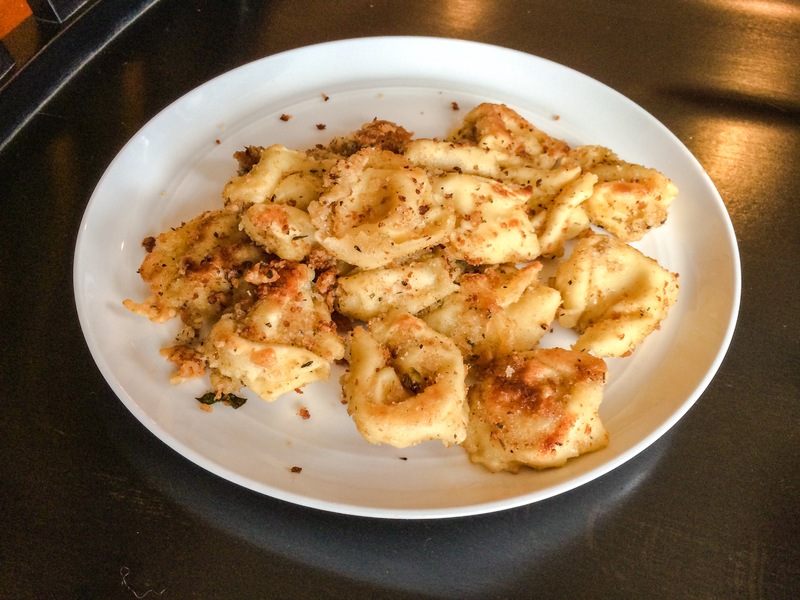 However, how about frying cheese tortellini? That works. And the little cheesy bites are soooo good. Fried Cheese Tortellini Bites are best served fresh from the skillet with your favorite warmed marinara for dipping. However, if you have leftovers, just refrigerate and then heat up in a lightly oiled fry pan the next day. Step 1: Cook tortellini according to package instructions. The Costco package had them boiled in salted water for just 2 minutes. Drain well. Step 2: Heat vegetable oil in a large skillet over medium high heat. I used a big electric skillet so I could cook more per batch. Step 3: Create an assembly line of bowls. In one bowl combine flour, salt and pepper to taste. In a second bowl beat the eggs. In a third bowl, combine Panko, Parmesan, Italian herbs and garlic powder. Set aside. Step 4: Working in batches, dredge tortellini in flour mixture, dip into eggs, then dredge in Panko mixture. Step 5: Add tortellini to the skillet, as many as you can fit in a single layer, and cook until evenly golden and crispy, about 2 minutes per side. Transfer to a paper towel-lined plate. Step 6: Serve warm with warmed marinara sauce.